The permit comes after the FAA's Office of Commercial Space Transportation recommended on April 30, 2012 that the FAA issue experimental permits and launch licenses because the agency had completed its Final Environmental Assessment for the Launch and Reentry of SpaceShipTwo Reusable Suborbital Rockets at the Mojave Air and Space Port and found no significant environmental impact with the proposed launch and landing site. The FAA assumed a maximum of up to 30 total launches and reentries per year of SpaceShipTwo at the Mojave Air and Space Port, for a total of up to 150 launches and reentries of SpaceShipTwo between 2012 and 2016 when it made the environmental assessment. 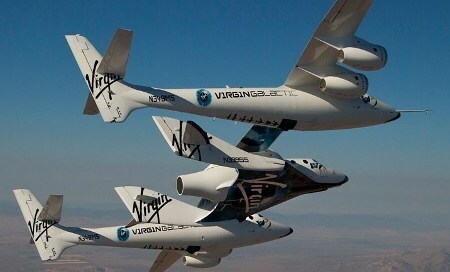 Virgin Galactic says that SpaceShipTwo and WhiteKnightTwo have made significant progress in their flight test program. With 80 test flights completed, WhiteKnightTwo is substantially through its test plan, while the more recently constructed SpaceShipTwo has safely completed sixteen free flights, including three that tested the vehicle’s unique “feathering” re-entry system. Additionally, ten test firings of the full scale SpaceShipTwo rocket motor, including full duration burns, have been safely and successfully completed. With this permit now in hand, Scaled is now authorized to press onward towards rocket-powered test flights. In preparation for those powered flights, SpaceShipTwo will soon return to flight, testing the aerodynamic performance of the spacecraft with the full weight of the rocket motor system on board. Integration of key rocket motor components, already begun during a now-concluding period of downtime for routine maintenance, will continue into the autumn. Scaled expects to begin rocket powered, supersonic flights under the just-issued experimental permit toward the end of the year. “The Spaceship program is making steady progress, and we are all looking forward to lighting the vehicle’s rocket engine in flight for the first time,” said Doug Shane, president of Scaled. Although a handful of experimental launch permits have been granted to other rockets, SpaceShipTwo is the first rocket-powered vehicle that carries humans on board to receive such a permit. SpaceShipOne, the manned spaceship successfully flown to space in 2004 and the basis for the design of SpaceShipTwo, flew before the Experimental Permit regulatory regime was established. The FAA’s Office of Commercial Space Transportation issues permits after it has determined that the vehicle operator has taken the appropriate steps to protect the public during testing. Permitees must submit detailed plans for vehicle design and operation in order to ensure that all possible scenarios have been addressed. Scaled Composites, LLC, a wholly owned subsidiary of Northrop Grumman Corporation, is an aerospace and specialty composites development company and the birthplace of many of the world’s most exciting aircraft in recent decades, including SpaceShipOne that won the $10 million Ansari X Prize in 2004, SpaceShipTwo, and Global Flyer. Founded in 1982 by Burt Rutan, Northrop Grumman’s Scaled Composites continues to focus on innovative, out-of-the-box aerospace solutions through its broad experience in air vehicle design, tooling and manufacturing, specialty composite structure design, analysis and fabrication, and developmental flight tests of air and space vehicles.